Ideal for a quick dinner and to make use of all the anti- oxidant packed squashes around at the moment. Toss the butternut squash and onion in the olive oil and roast in the oven for about 20 minutes. Add the cherry tomatoes and cook for a further 10 to 15 minutes. 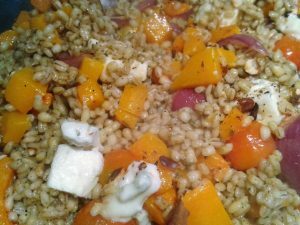 Meanwhile cook the garlic in a frying pan over a low heat and then add the barley, stirring until all the grains are coated. Slowly add half of the stock, stir and when most of the liquid has been absorbed add the remainder and the dried sage and cook until barley is tender (approx 35/40 minutes. Stir in the squash, onions and tomatoes and top with the cheese and sprinkle with almonds.